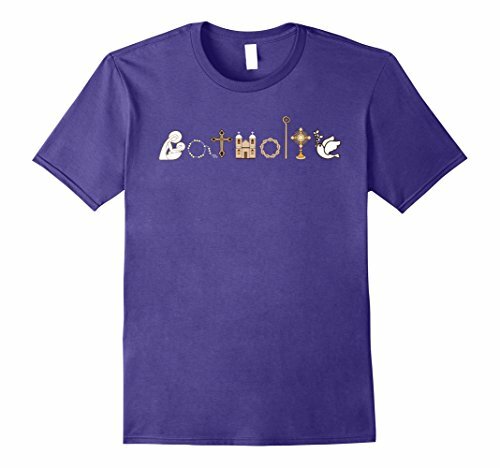 This Catholic Symbol Shirt spells out the word Catholic in various religious emblems. Great for the Faithful Christian Roman Catholic Interested in the Blessed Sacrament, Holy Mass, or Communion of Saints. Witness your faith and dedication to Jesus and the Eucharist Host with this Catholic Shirt by Catholic Church T Shirt Tees. Perfect for those who participate in Rosary Prayer and who believe in the Blessed Virgin Mary, Crucifixion, the Eucharist Last Supper, and Vatican History. Celebrate your faith in Jesus. Order today. Tee depicts the word Catholic spelled out in symbols and religious emblems. Perfect for the Roman Catholic Student, priest, or those that believe in the blessed sacrament. . If you have any questions about this product by Catholic Church T Shirt Tees, contact us by completing and submitting the form below. If you are looking for a specif part number, please include it with your message.